My cell phone rang just as I was stepping out the door to fork some hay to the sheep in the -10 degree nip of the morning. It was our local large carnivore biologist calling to give me a heads-up about a pack of wolves roaming just outside our sheep pasture. 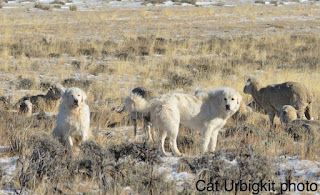 Apparently state wildlife officials had logged numerous sightings of a pack of three wolves, and our flock is the nearest livestock in the area where the wolves are roaming. While the call was much appreciated, the presence of a pack of wolves in the neighborhood has been evident for the last month. Our livestock guardians have been on edge, with the dogs alternating between hyper-aggression and exhaustion. 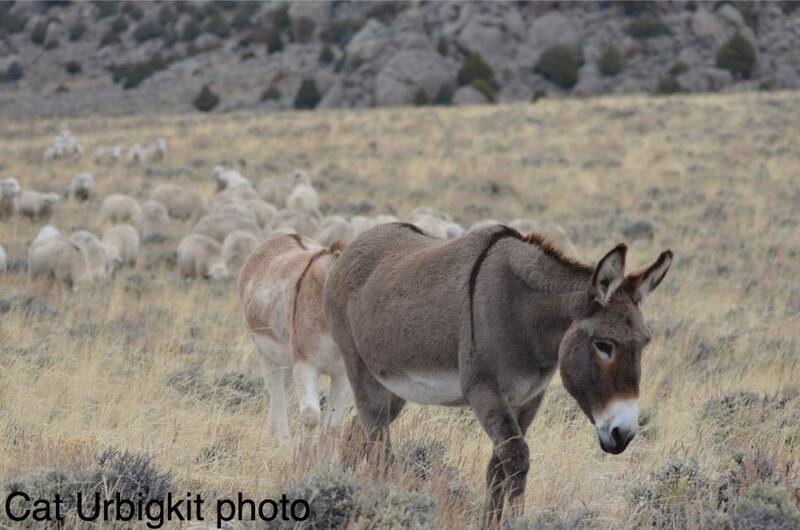 In early November, the sheep flock busted through a fence and fled their river bottom pasture, taking the dogs with them, but leaving the burros behind. When I arrived later that day, the burros were sweated up and nervous, huddled near the hole in the fence where the sheep had escaped. When I approached, all three burros were spooky, fleeing from me, jumping the fence and landing out on the county roadway (after one got tangled and fell, cutting herself on the wire in the process). I raced around on foot to catch up, and calmed them, convincing them to follow me through a small walk-in gate off the county road to get them into the same pasture where the sheep had fled. 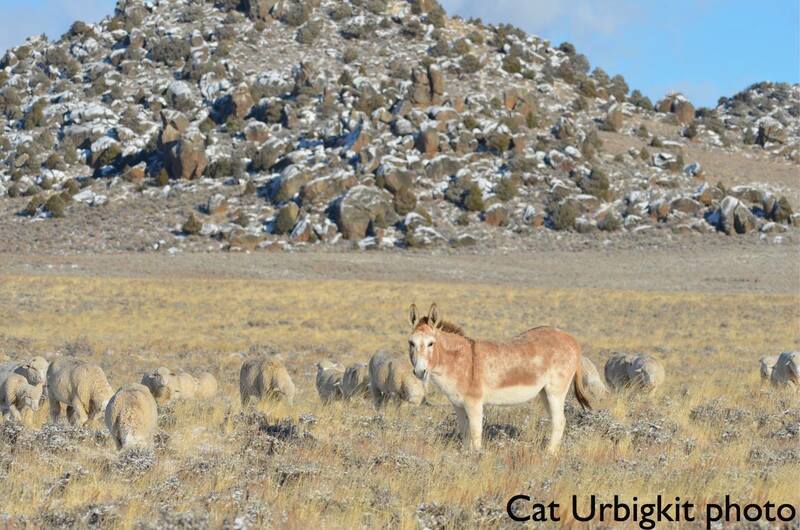 I’ve lived and worked with these formerly wild burros for years, and been with them when we’ve had bigger predators – including bears – in the pasture, and never saw any such panicked behavior in that time, so it seemed logical that the presence of a major predator was responsible for their nervous state. In the following days, we heard numerous reports from elk and deer hunters of a pack of six wolves roaming to the northeast. We left the sheep flock and guardian dogs (reunited with their burros) in the larger pasture away from the river bottom, which we know serves as a corridor for predators. 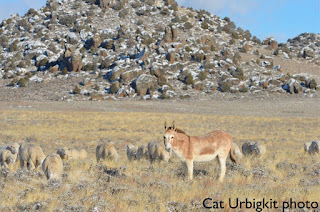 The pasture is huge, and the flock stayed out in the middle of the sagebrush-covered flat, away from the mountainside behind, and the river corridor along its eastern edge. When the flock was hesitant to go back to the river to water, we set up a portable tank and hauled water to them on the flat. Our peaceful and beautiful days on the range changed with the tension in the air, and finally, last week I decided I couldn’t stand it any more. We hauled the entire herd, the burros, and the dogs, to our house, 40 miles distant, on Saturday, and started feeding hay. 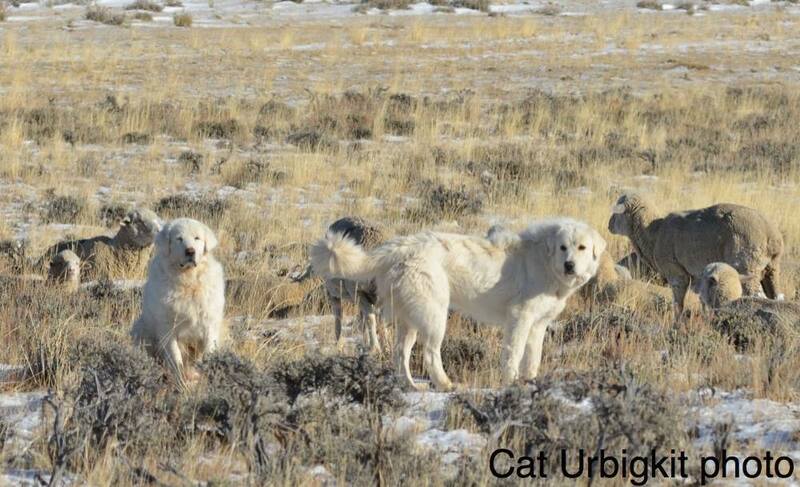 The wolves spotted just south of the flat again on Sunday, but thankfully our herd was gone. But my neighbor, good friend and business partner, has a flock just seven miles from the pasture we fled. He was going to be the next call for the state wildlife guy who phoned me Monday morning. Wolves in our region reached biological recovery goals more than a decade ago, yet remain under full federal protection. There is little a livestock producer can do when a pack moves in. 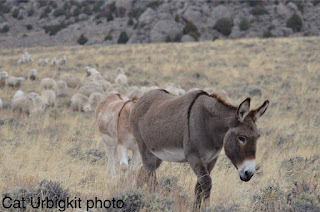 Only once there is dead livestock on the ground can control be initiated by federal officials – even when the killing occurs on private property. I’m resting easier now that I’ve had the luxury of moving my flock away from immediate danger, but sick at heart knowing that the problem will only migrate to my neighbor. I can certainly understand the tension and trouble with the guardians and livestock. What would you do if you were able to commit a preemptive act? Hire a plane or helicopter and gunner when a pack is spotted in your vicinity? Or ride out and howl at them? I'm sure there's many other actions, some I can think of and others I can't. Not that this is a pack of wolves...Here in the Boston area we have the opposite problem with people not understanding the solution. They are having a controlled deer hunt in Blue Hills just south of the city a very urban with a fun small "hill" (ask Steve; near and dear to his heart) the population of deer has multiplied into dangerous amounts. There are many people picketing and standing in the way who do not understand the reality of the situation. Seems like in most places there are no win win fixes. It is the same thing of course, K-- people refusing to see biological reality. Cat, Karen and George actually took a course for learning how to trap and deal with pest animals- near Boston! They did it for the skills, but it does bring an unusual viewpoint for an urban naturalist. The Blue Hills are also unusual. & have perhaps the only urban Timber rattler population-- my friend Tom Palmer wrote a book about them, well worth reading. K, will try to call you and George tonight.